The answer is …. Sort of. I don’t necessarily wear the EXACT SAME THING EVERY DAY, but yes, I have about 4-5 outfits that I wear ALL THE TIME. We make 35,000 decisions a day. That drains us. As a business owner, mom and CFO and COO (and housekeeper and launderer …) of our household, I’ve got A LOT TO DO. So the last thing I want to waste my energy on is figuring out what the heck to wear. I wear mostly black, dark blue, white and gray. I usually wear black leggings with a tunic-style shirt. (My fave leggings are here: Athleta – pricey but worth it – and Old Navy – inexpensive, so you can buy several). I try to buy higher quality items so that they last longer and wash better. I choose things can be dressed up or dressed down. I wear things that are comfortable. And that’s about it. There’s no magic formula. There’s no exact number of items. There are no rules. Ok, so now you may be thinking. Sounds great, Amanda. All puppies and butterflies. But how the heck do I get to that point?? Kondo It – The KonMari MethodTM provides a great path for making sure EVERYTHING in your closet “sparks joy”. 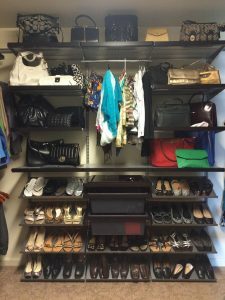 You can get this done in less than 5 hours, with a patient friend or a professional organizer like me. Check out my step-by-step blog post here. Edit often – Sometimes I’ll catch a non-joy-sparking offender in my closet and ask myself “How the heck did you survive in here this long?” Toss it in a basket in your closet, and when the basket is full, donate it. Keep a shopping list – I use Wunderlist to keep a running list of things I need. I do NOT wander aimlessly through the mall. Right now, I need a black camisole and black crew socks. That’s it. When you are at a stage in life where you’ve just got TOO MUCH TO DO, then DO LESS. Channel your inner Steve Jobs (black tee and jeans! ), make one less decision, and kick your morning off right. We are in the midst of a heatwave here in Eastern PA. Today for example is 97°, with a feels like temp of 106°…ouch! Not the most conducive weather for organizing, right? Well, definitely don’t work in the garage, or the attic…basically avoid anyplace that isn’t close to air conditioning or where heat rises. That still leaves some great spaces throughout your home to work in. However, before you even start, grab some ice-cold water or your favorite cold beverage and sit down to write out some to- do lists. Nothing fancy, a spiral bound notebook from your child that still had useable pages in it will do; you know that they’ll want something brand new for the next school year anyway! 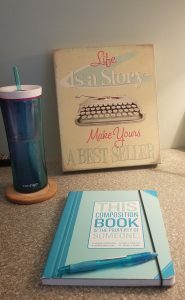 I bought myself a fun notebook from TJ Maxx (see picture), in my favorite color, to make it less of a chore. Prefer an app for your to-do lists? Trello is a fantastic app which lets you create endless topics (lists) and tasks (cards). Start by writing the name of each room in your home on a separate page. The great thing about these lists is that they can be a summer and beyond project…no need to rush it! Next, start your brain dump, where you can write tasks to be done in each room. Write down what comes to mind and add more as you think of it. The tasks should be specific and therefore hopefully less overwhelming. It’s up to you to choose how many tasks you want to complete at a time! Do you have other things come to mind, that aren’t specific to a room? Write them down too! Getting too much junk mail? Look to catalogchoice.org and optoutprescreen.com. Getting too many spam calls? Try an phone app like, Should I answer?, with a cute little octopus icon, which turns green for a positive call or red, to know instantly if a call has received negative ratings, and block them on your phone! I know, I know, once a company is blocked by using one number, they will move to another, but every little block counts! Pen and paper or app, the key to dissolving a cluttered mind is to write things down, so that you have space in your brain for more important things to think about, like what flavor of ice cream to get tonight! I learned this with a new client: Kim (not her real name) has struggled all her life to maintain a neat space. Her efforts go in waves and she has managed to live a really rich and creative life — but it hasn’t been easy. She’s lost a few things along the way. Paid her share of late fees for bills and penalties for misplaced parking tickets. And wasted time rewashing clothes after the dirty commingled with the clean. 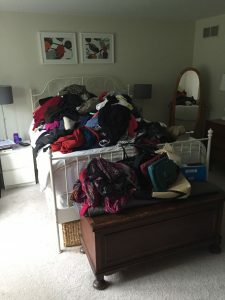 When she was ready to stop this chaos…she called in a professional organizer. We started in her bedroom because the mess was affecting her sleep. 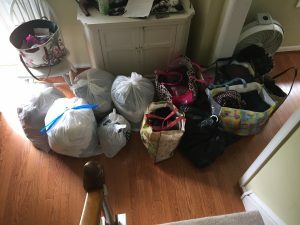 After 3 working sessions we had sorted through all of her clothes, cleared every surface (including the floor) of anything that didn’t belong, rearranged her dresser drawers and closet with zones for each type of clothing she needed in her life. Moving on to the living room, Kim sheepishly told me a “funny” story about her missing slippers. The one constant in Kim’s life had been lots of weekends away to cabins with friends. In preparing to pack for one such weekend, she described how she had scoured her apartment looking for her slippers. She checked ALL of her usual spots: under the coffee table, in the bathroom, kicked under the hallway table, in a pile behind the couch, tucked under her bed, tossed into a corner by her cat…she couldn’t find them anywhere. She left for her weekend sans slippers in a bummed mood. As soon as she got on the road to the cabin, it hit her. She couldn’t help but laugh out loud. Her slippers were right where we had left them — in their new home. They were in the bottom “bay” of the hanging shoe organizer we had installed in her closet. It was a funny lesson to us both, that getting organized takes some getting used to! 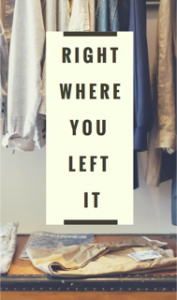 The motto of Kim’s story is: It’s easy to find what you need when you need it…when it is right where you left it. So, I’ve been saying that a lot lately and not to who you would think. It’s been to inanimate objects! You know, the smoothie you start drinking again because you are going to give ‘that diet’ another go. Why do we address people and things this way? A matter of playful affection towards a friend who we’ve known since grade school? Used in jest as we put on our bikini for the first time in the Summer? Is it really old and needs to be tossed? Has it worn out its welcome? Is it really a friend? Was it kind to you over the years? You know, that go-to outfit that never disappointed? Friends come and go and so do the things in our lives. If it doesn’t bring you joy, it’s time to say adieu. Keep the items you hold valuable close to you and enjoy! Click on the above title to learn more about the featured author. Do you ever open your closet and think, “I have nothing to wear!”? Do you ever feel like you have certain “go-tos” and you ignore the rest of your closet? Do you keep things because they might come back into style? Imagine a different scenario. Imagine a closet filled with only those clothes that ‘spark joy,’ clothes that make you feel confident and amazing, clothes that are comfortable and cared for. In just five hours, it can! The New York Times bestseller, The Life-Changing Magic of Tidying Up, by Japanese de-cluttering guru Marie Kondo, teaches you how. As a member of the first class of KonMari consultant trainees, I love spreading the KonMari idea of #organizetheworld. 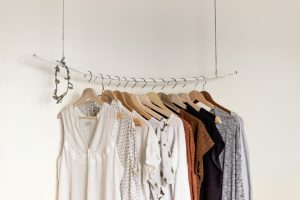 Please see below my own take on how you can tackle the clothing category using the KonMari method, step by step. Find a time in your schedule when you can get five hours, distraction free. No kids. No husbands. No phones. This is YOUR time. Pile every item of clothing on the bed. Make sure ALL of your clothes are washed. Drag those off-season clothes out of the basement. Bring up those coats from the entry-way closet. Pull out those old bridesmaid dresses. Divide the clothes into broad categories like: Tops, Bottoms, Skirts, Pajamas, etc. Don’t worry about deciding what to keep yet. Focus on sorting, not discarding. Now this is where the magic really comes in. You are going to take each and every item of clothing in your hand and ask yourself: Does this spark joy? Pay attention to how the garment makes you feel. Does it give you a jolt of happiness? Do you love wearing it? Or do you frown, think about feeling frumpy, or have a bad memory? Start with a smaller category so that you can feel the momentum. As you go, write down items that need to be replaced or upgraded. Midway, take a 15-minute break. Have some tea and a light snack. Take stock at the four hour mark. You might need to leave a few categories for homework, like shoes and bags. Put all of your donations and items to sell right in the car! While you have them sorted, you can even enter the donations into an app like It’s Deductible or onto a printed Goodwill checklist. You can save thousands at tax time with donations! 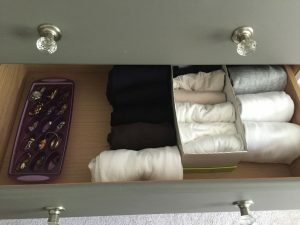 Put all of the clothing that sparks joy back into the closet and folded in their drawers. To learn how to do Marie Kondo’s special folding method, visit this video. Think about using all that extra space in your closet to display your favorite items. 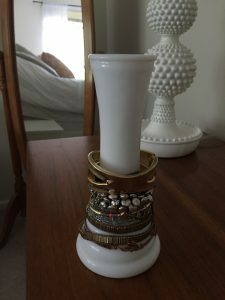 I put my favorite books and my grandmother’s milk glass on the top shelf of my closet, where all of my bulky sweaters used to fall over onto each other. Some people hang artwork inside the doors or display wedding photos. If you find yourself thinking, “I might wear this someday,” think again. Think about your life today. Set aside sentimental items. Can you turn that fabric into a cool pouch? Can you display it? It’s tempting to want to sell your items. Be aware that consignors are VERY selective. Often, you will get more back by donating the item and cashing in on a tax refund. Now sit back, take that after photo, and enjoy! 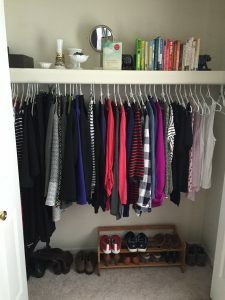 After just five hours and six steps, you’ve created a closet that gives you joy, easy mornings and a boost of confidence. Bedding-blitz As you prepare to leave colder days behind, get ready to pull out lighter blankets and sheets. Refresh blankets that come out of storage by fluffing them in the dryer with a dryer sheet. Remove heavy blankets and flannels from beds to clean and store. This is also a good time to wash the mattress covers and give the mattresses a flip. Lighter, brighter spring-fresh bedding is sure to brighten everyone’s mood! Counter-attack Throw open the kitchen and bathroom windows and take a look at your counters. The fresh air will help energize you while you remove all items and give the counters a good wipe-down. Throw out any trash or items you don’t need and put away anything that has wandered out of its appropriate home. Return to the counter only those things that you absolutely must have out or that make you happy. Pantry purge During our winter hibernation we tend to stockpile supplies. Cupboards can become stuffed with soups, cocoas and comfort-snacks. As this happens, other food items get pushed out of sight. Set aside an hour on a nice spring morning to empty out a shelf or two at a time, wipe them down, discard outdated or unwanted food items and reorganize what’s left back onto the shelves. Sew or go Do you keep a sewing or ironing pile? If you do, make sure that what is in your pile has not been there longer than 6 months. If it has, it is likely that it may not fit, will be out of style, or will no longer be something that you think would be worth the effort. Now’s the time to sew or go! Pick an evening and an interesting TV show and get the ironing and sewing done. If you’re not going to do it – let it go. It will only sit there and make you feel guilty if you don’t. And, no one wants to feel bad on a sunny day! Shoe-review The warmer days of spring and summer will mean a change of shoe style. Take time to gather any and all of your shoes together. Separate cold-weather shoes from warm. Before storing shoes you won’t wear again until fall, try them on. If they don’t fit comfortably or you don’t like them, this is the time to donate or toss them. If any need cleaning or repair, get it done now, before storing. Next, look at their sunny day counterparts and go through the same process. If you find that your favorite sandals are broken or that those cute open toe shoes you bought last summer don’t really fit right, get rid of them. Take note of any shoes you may need to add to your shopping list for replacement to complete your wardrobe. Finally, make sure each member of your household has adequate shoe storage. will be emailed each time we publish a new & useful organizing article to our Blog. Do Organizers Practice What They Preach?